I will respond to these charges but, first, let me say that I understand scholarship is a matter of bread and butter for some. But, not to the Oromo people. In the name of scholarship, Oromos should not be expected to refrain from raising legitimate questions about those who claim to know what is best for the Oromo people. Their questions should not be construed as intending to cause hostility just because those to whom these questions are directed find them difficult to answer. Secondly, I would like to remind the reader that whatever was attributed to Berhanu Nega in my blog was taken from his book (Ya Nasaannat Gohi Sii Qaddi) and can be verified for accuracy. To my recollection, the only person whose appearance at an OSA conference was canceled because of public outrage was that of Col. Goshu Welde who took part in the decimation and great suffering of our people as a member of the military junta – the DERG. The then OSA president, Asfaw Beyene, had the audacity to invite him to the 20th anniversary of OSA. Mind you, Goshu Welde was neither a scholar nor a researcher by any stretch of the imagination. His qualification for speaking at OSA conference was being Ethiopianist politician – plain and simple. OSA had no business organizing meetings for politicians to assist them in dissemination of their political views. I would argue that the reason for Berhanu’s invitation to OSA conference is no different from that for Goshu Welde. Again, I maintain that OSA has no business assisting dissemination of political views particularly those against Oromo aspirations like that Of Berhanu Nega’s. 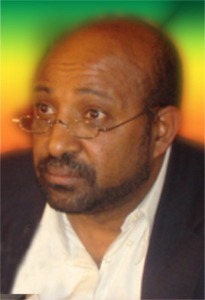 Berhanu’s presentation at OSA 2010 must be opposed on a couple of grounds. First, contrary to what Jawar would have us believe, Berhanu’s, not only opinion but also, political actions have been fundamentally hostile to aspirations of the Oromo people. As far as the Oromo question and aspirations are concerned, there is no difference of views between Males Zenawi and Berhanu Nega. They only differ in how they go about implementing their solutions – the former by making a promise it does not intend to keep, the later refusing to even acknowledge our rights. Let me also remind the reader that Kinijit, Berhanu Nega’s former party, was made up of many unitarist parties. Membership was open only to those parties that were not affiliated with ethnic groups. Oromo federalist parties like Bulcha Damaksa’s WAFIDO and Marara Gudina’s ONC were not welcomed by Kinijit. To my knowledge, Berhanu has never repented for these serious offences against our people’s aspirations. Second, to make a scholarly presentation on a subject, one must have gained mastery of that discipline through years of study and must be able to speak with authority and clarity on the subject. As one can see from the title, Berhanu’s presentation has nothing to do with his field of expertise which happens to be Economics. Berhanu will be presenting “Ethnic Identity and Political Developments of the Last Two Decades” which is not his area of scholarship. By his own admission, he got interested in understanding ethnicity in the Ethiopian empire as a result of meeting Oromo detainees in TPLF dungeons. Even then, what struck him was not the suffering they were undergoing but their “hateful feelings” against his immiyyee Ethiopia. Plain and simple, Berhanu will be speaking at OSA conference as a politician, not as scholar. His appearance at OSA conference at this time is a continuation the dialogue currently underway between Berhanu’s Ginbot 7 and the Dawud Ibsaa faction of the OLF in which OSA, a purportedly scholarly organization, should have no part. It is a public secret that disappointed by the death of Alliance for Freedom and Democracy (AFD), to which Berhanu’s former party Kinijit and Dawud Ibsaas faction of the OLF were parties, Eritrea has been working hard on resurrecting it in some form. Many meetings have taken place between these two Ethiopian opposition parties. Here in the USA Shanee representatives and Berhanu Nega have met many times to discuss how to democratize Ethiopia. Andargachedw Tsigie of Ginbot 7 has travelled “multiple times” to Asmara to meet with Obbo Dawud Ibsaa and his faction hosted by the Eritrean government. Reliable sources have informed this blogger that the two Ethiopian opposition groups have agreed on many issues and are very close to forming an alliance. Wouldn’t it be nice to acquaint the Oromo public with Berhanu Nega and Bayan Asoba sitting side by side and addressing audiences beginning now? That may be, but OSA is hardly the appropriate venue for such political events. Finally, Obbo Jawar informs us of his “various strategic disagreements” with his protégé, Berhanu Nega, without informing us what these disagreements are. I only know of one: that Jawar advocates for dismantling, and doing away with, the OLF whereas Berhanu Nega is at least talking with a faction of that organization. A “strategic disagreement” indeed! In light of the fact that Berhanu Nega (formerly of Kinijit and now of Ginbot 7) will be speaking at Oromo Studies Association Conference (OSA) this year, would you please repost your article about Ato Berhanu from years ago to inform the public about this man? The panel is organized by Asfaw Beyene and includes Beyan Asoba and David Shinn." See HERE. Blogger: I personally am not surprised given the cozy relationship between Ginbot 7 and Shanee on the one hand and Shanee and OSA on the other. The article in question is "Berhanu Nega’s Shocking Encounter with Oromo Detainees Led to his Politcal Career". I never took it down. You will find it HERE. Enjoy and have your say.